The Q30 previews an entry-level car aimed at young buyers. 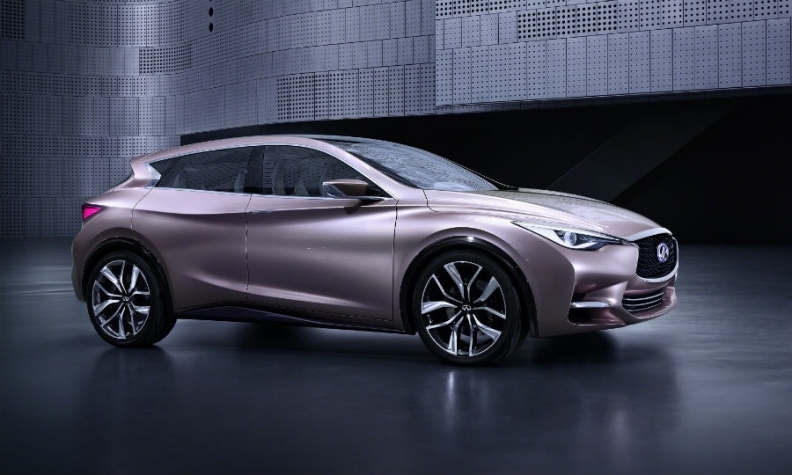 Infiniti today released the first image of the Q30 Concept that previews an entry-level premium compact planned to broaden the brand's product lineup and appeal. Infiniti said the concept's design fuses the sporty body style of a coupe with a hatchback's roominess and the higher stance of a crossover. "It is designed for younger customers seeking an alternative to traditional premium compact vehicles and open to convention-challenging approaches," Infiniti said in a statement. The concept will debut at the Frankfurt auto show on September 10. A production version, to be built at Nissan's plant in Sunderland, England, will go on sale in 2015 in global markets including the United States. Infiniti's U.S. sales have slipped 9 percent to 59,995 this year through July in an overall light-vehicle market that has advanced 8 percent. Premium automakers are targeting smaller vehicle segments to add sales volume, and because of shifting consumer preferences and more stringent fuel economy requirements by governments worldwide. The Q30 will compete against models such as the Mercedes A class, BMW 1 series and Audi A3. Nissan is expanding the Sunderland plant's annual capacity to 550,000 from 500,000 units to accommodate the Q30. The factory builds the Nissan Qashqai, Juke, Note and European versions of the Leaf.